The Los Angeles Civic Center Master Plan is heading to the full city council for consideration, and eventually, the mayor’s office. The City of Los Angeles is moving quickly in its efforts to rework the historic Civic Center district as it aims to rectify nagging post-World War II era planning and building legacies amid a period of intense development within surrounding Downtown Los Angeles neighborhoods. The areas around the district—roughly encompassed by the 101 Freeway, Judge John Aiso Street, 1st Street and Grand Avenue—are already undergoing broad change, including the recent completion of the SOM-designed Los Angeles U.S District Courthouse and the forthcoming First and Broadway park by Mia Lehrer+Associates and OMA. The area is also due to receive a series of high-rise residential towers from Canadian developers Onni Group, including a boxy scheme by Gensler and a collection of pointed condo towers by AC Martin. The draft plan aims to convert the purpose-built bureaucratic and administrative quarter into a “Civic Innovation District”—a mixed-use neighborhood containing street-fronting retail, startup office space, broad pedestrian paths, a bounty of public parks, and high-rise residential housing. In March, the Los Angeles City Council voted to approve the new Civic Center Master Plan—a document based on a study by multi-service firm IBI Group that would guide the redevelopment of the area. The plan envisions adding 1.2 million square feet of office space to the area, as well as roughly 1.1 million square feet of housing, and at least 217,500 square feet of retail space, all the while reworking surrounding streets and blocks into a network of interconnected, axially-driven, pedestrian-friendly promenades. Most controversially, instituting the plan involves demolishing a variety of structures, including the historic but socially-problematic former Los Angeles Police Department headquarters from 1955—designed by architect Welton Becket and known as Parker Center. The modernist-style City Hall East building and the Metropolitan Detention Center, a 757-bed federal prison, would also be demolished via the plan, among other structures. Another aim of the plan is to establish City Hall as the visual and conceptual locus for an area that would stitch together the Bunker Hill, Little Tokyo, Arts District, and El Pueblo neighborhoods. The plan would be implemented over six phases beginning later this year with the demolition of Parker Center. That structure was recently denied historic status and is headed toward demolition, to be replaced with a high-rise tower containing 712,500 square feet of office space and 37,500 square feet of ground floor retail. The existing City Hall South building will be replaced starting in 2019 with 569,000 square feet of housing and 90,000 square feet of retail uses in a podium-style tower that would also create a paseo between itself and the City Hall East building. The housing tower would face the Morphosis-designed CalTrans Building from 2004 and would sit diagonally from the new Los Angeles Police Department Headquarters building by AECOM from 2009 that made the Parker Center structure functionally redundant. Starting in 2021, the scheme calls for converting the existing Los Angeles Mall into a 390-foot tall tower complex containing 675,000 square feet of government office, commercial, and flexible spaces. The podium-style building will leave generous, wedge-shaped areas along the ground as open space. A fourth phase would bring another 520,000 square feet of housing and 90,000 square feet of retail to the southern portion of the block containing the Parker Center’s replacement between 2024 and 2027. Planning documents show those structures as a series of wedge-shaped housing towers and low commercial buildings organized around a continuation of the paseo started on the block just to the north. This paseo would connect to the booming Little Tokyo and Arts District neighborhoods, which are due to receive a slew of high-rise, mixed-use developments along the Alameda Corridor, as well. Following that development—the document times phase five to start in 2027—the Metropolitan Detention Center at the eastern edge of the block will make way for a 360,000-square-foot government office and retail tower. It is unclear whether the prison will be replaced locally or elsewhere. The final phase of the plan would demolish the modernist-style City Hall East building, replacing the striking 13-story tower with a small cultural building and a civic plaza. The plan, as specified, would be completed sometime between 2030 and 2032. A recently-released rendering by IBI Group describes the area as a more uniformly 12-20 story tall cluster of towers separated by broad swaths of open space. The plan—more radically—also envisions placing a lid over a three-block section of the 101 Freeway currently dividing the Civic Center from the El Pueblo and Union Station areas. 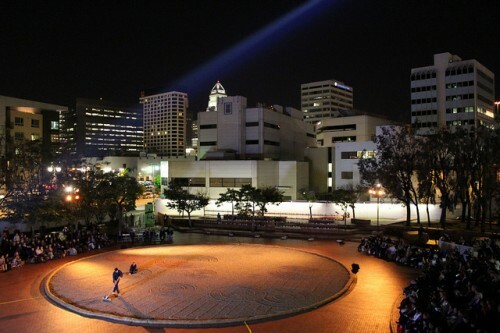 The connection would make the Civic Center area accessible to the currently-under-construction $410 million La Plaza de Cultura project by Johnson Fain, Benchmark Contractors, and the non-profit Cesar Chavez Foundation. That project aims to bring 355 housing units at 46,000-square feet of retail space to the area. 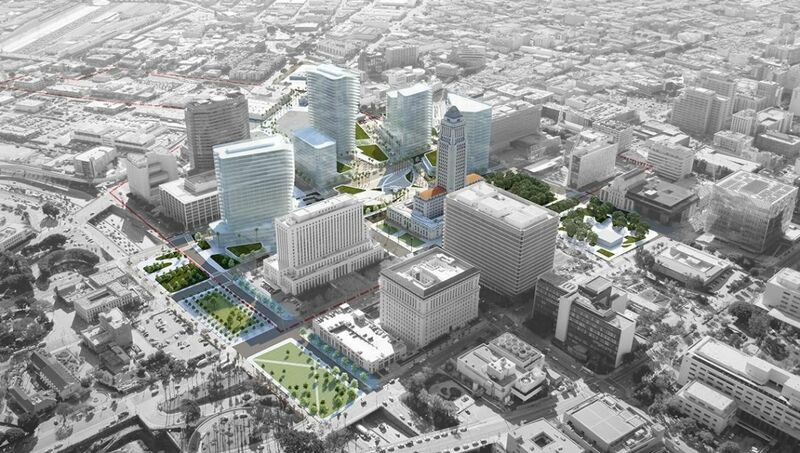 Once completed, the Civic Center Master Plan has the potential to convert the sleepy, bureaucratic district into the lynchpin of a continuous, mixed-use center spanning from Pershing Square at the heart of downtown to the western banks of the Los Angeles River on one end and Chinatown on the other. The areas between the Civic Center and the Arts District are expected to receive a series of stops along the new Regional Connector subway line, a condition that will surely drive further residential and commercial growth in the area. The plan was recently approved by the Los Angeles City Council’s Entertainment and Facilities Committee. It now heads for consideration by the full city council, and eventually, the mayor’s office. Renderings have been released for a DGB +Line-designed mixed-use, podium-style project on the eastern edge of Los Angeles’s Little Tokyo neighborhood. The project, if built as proposed, will begin the process of extending the Downtown Los Angeles skyline eastward. According to a report filed with the city, the development aims to replace the existing Little Tokyo Gallery indoor mall 333 S. Alameda Street with a collection of mid- and high-rise residential towers: 994 housing units and 100,000 square feet of retail in all. The development will include 160 affordable housing units as well as 110 live/work units within the overall total. Like other large-scale projects being proposed for the surrounding areas, the project will be carved into smaller masses via outdoor, retail-lined passageways. 333 S. Alameda is proposed as a podium-style development punctuated by four towers, the highest of which could rise up to 34-stories in height. 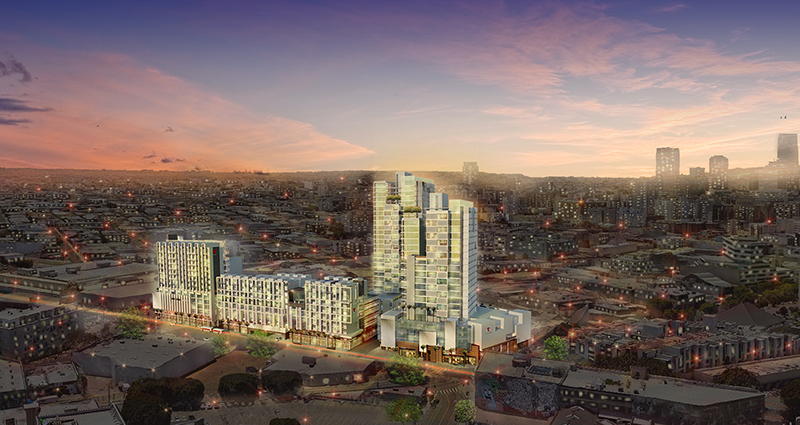 The complex will feature a pair of taller towers on the northwest corner of the site with a linear cluster of 10- to 15-story blocks along Alameda Street. Renderings released showcase glass- and panel-clad facades for the taller towers with punched opening-studded frontages along the shorter blocks. The transformative project lies at an elbow between the bustling Little Tokyo and booming Arts District neighborhoods and will be just two blocks from the forthcoming Regional Connector light rail transit stop at First Street and Central Avenue. Furthermore, the project sits along the Alameda Street Corridor, a regional thoroughfare that Los Angeles Metro is exploring for a potential light rail line to Santa Ana. It is also not alone in terms of tall, dense projects: Herzog & de Meuron and developer SunCal are working on a $2 billion mixed-use tower project at 6th and Alameda Streets. In fact, several of the sites surrounding 333 S. Alameda are currently in the process of being redeveloped as taller developments, including another podium-style building to be located directly across the street at 330 S. Alameda by VTBS Architects. A timeline for construction has not been released.